§1.1.The Behistun inscription had a key role in the decipherment of the major Near Eastern cuneiform writing systems, and thus helped to establish the field of Assyriology. This inscription is the longest ever left by Achaemenids and contains a tri-lingual royal text with a detailed account of Darius’s accession to the throne of the Persian empire and the suppression of revolts shortly after Darius’s accession. §1.2. Despite its high position on a huge cliff that made it inaccessible to human damage, natural erosion has obscured several of its passages. In some parts, cuneiform signs are partially visible at best, while in others they have been completely lost. Moreover, this situation has made close observation and copying of the inscription difficult for Assyriologysts. Aside from Henry C. Rawlinson, who for the first time accessed the inscription from 1835 to 1846 and copied its cuneiform texts, only on a few occasions have scholars closely copied and examined the inscription. In 1903, Abraham V. W. Jackson visited the inscription, and thereatfer Leonard W. King and Reginald. C. Thompson (1904) and George G. Cameron (1948 & 1957) copied and studied its cuneiform texts in some detail. They provided copies of the inscriptions, employing methods that are today dated, such as drawing of signs, paper or latex impressions, or photography with old cameras. Although their attempts resulted in improved editions of prior copies, a re-examination of the inscription appears essential to provide an optimized edition of all its cuneiform texts. §1.3. 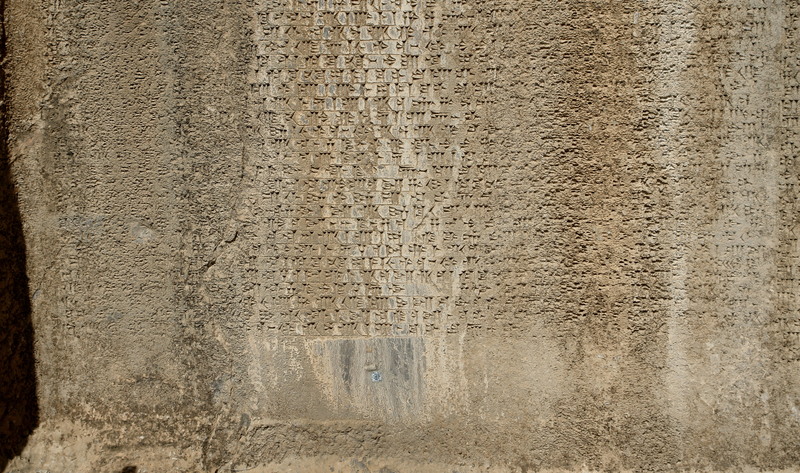 Due to inaccuracy of prior copies in representing details of the original engravings, they offer limited help to Assyriologists to provide improved editions of the Behistun inscription. Scholars who performed research on the Behistun material inevitably relied on those dated copies so that their results retained embedded errors and contain unread gaps and doubtful readings. In fact, most of the published editions were not accompanied by photographs or even hand-copies and cannot be verified to any satisfactory degree. It is an unfortunate truth that the squeezes of this inscription resulting from Cameron’s detailed study in 1948, otherwise a treasure trove in research on Behistun, were severely damaged. Moreover, the typed cuneiform text published in King & Thompson 1907 doe not adequately represent the idiosyncrasies and imperfections of the original engravings, and it is effectively impossible for Assyriologists to judge many of their readings. §1.4. Therefore, in order to prepare a new edition and explore more of the Behistun inscription, it is necessary to produce new copies that clarify more details, especially on traces in damaged passages. Since 2013, I have been conducting research on the Elamite version of the inscription, aimed at producing accurate copies and preparing a new edition. Since this version is very substantial, I plan to publish the results in a series of articles. This contribution offers an edition of column i; the remaining sections will be published in subsequent articles. §2.1. The monument of Behistun is engraved on a massive cliff at Mount Behistun, located near Kermanshah, in western Iran. This monument consists of a relief sculpture and a tri-lingual inscription in Old Persian, Elamite and Babylonian Akkadian. 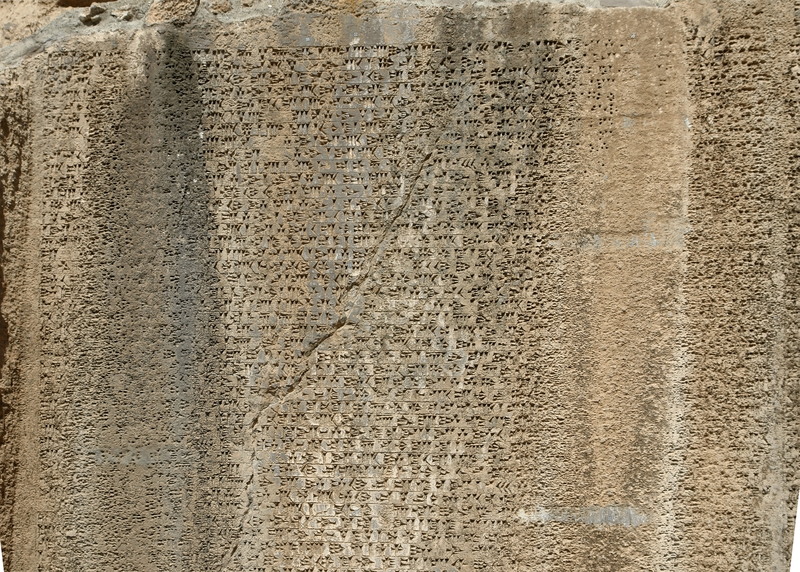 Each version is arranged in a number of columns wherein the text is divided into segments, each one beginning: “Darius the king says,” or “And Darius the king says.” In addition, a number of small tri-lingual and bi-lingual inscripions in Old Persian and Elamite only are situated on the empty sections of the relief panel, or on its lower margins. §3.1. The older Elamite version of the Behistun inscription was engraved to the right of the sculptured reliefs. But since it became necessary later to make room for the relief of the captured Scythian rebel “Skunxa,” this version was erased by the same engravers and then, as its copy, the newer Elamite version was written beneath the Babylonian version. The newer Elamite version (hereafter the Elamite version) was engraved in three large columns and its text contains fifty-four segments, hereafter designated “paragraphs” (abbr. par. or §). Moreover, as mentioned above, the Elamite version of small inscriptions together with Old Persian or Babylonian ones are placed on the empty part of the relief panel, or on its lower margins. In this article, the text of column i (= paragraphs 1-20) of the Elamite version is presented in some detail. par. 1 dišu2 dišda-ri-ia-ma-˹u˺-iš dišeššana ir-ša2-ir-ra dišeššana dišeššana-ip-in-na dišeššana ašbar-šipx-ik-ka4 dišeššana diš˹da˺-a-˹u2-iš-be-na˺ dišmi-˹iš˺-da-aš2-ba ša2-ak-ri diš˹ir˺-ša2-ma dišru-uḫ-ḫu-ša2-ak-ri dišḫa-ka4-man-nu-ši-ia I (am) Darius, the great king, king of kings, king in Persia, king of nations; Hystaspes, his son, Arsames, his grandson, an Achaemenid. par. 2 a-ak ˹dišda˺-[ri]-˹ia-ma˺-u-iš dišeššana na-an-ri ˹dišu2˺ diš˹ad˺-da-da dišmi-iš-da-aš2-ba a-ak dišmi-iš-da-aš2-ba dišat-te-ri dišir-˹ša2-um-ma a˺-[ak] ˹dišir-ša2˺-um-ma ˹dišat˺-te-ri diš˹ḫar-ri˺-ia-˹ra˺-um-na a-ak dišḫar-ri-ia-ra-um-na dišat-te-r˹i˺ dišzi2-iš-pi-iš a-˹ak dišzi2˺-[iš-pi]-˹iš˺ [diš]˹at-te-ri dišḫa˺-ak-ka4-man-nu-˹iš˺ And Darius the king says: As for me, my father (was) Hystaspes, and as for Hystaspes, his father (was) Arsames, and as for Arsames, his father (was) Ariaramnes, and as for Ariaramnes, his father (was) Teispes, and as for Teispes, his father (was) Achaemenes. par. 3 a-˹ak˺ diš˹da˺-ri-ia-ma-u-iš dišeššana na-an-ri ḫu-uḫ-be in-˹tuk˺-ki-me dišnu-ku dišnumun-˹meš dišḫa-ak˺-[ka4-man]-˹nu-iš-ši˺-ia ˹ti-ri˺-ma-nu-un ša2-˹aš2-ša2-da˺ ka4-˹ra-da-la˺-ri dišša2-lu-u2-ud a-ak ša2-aš2-ša2-da ˹ka4˺-ra-˹da˺-la-ri dišnumun-˹meš diš˺[nu]-˹ka4-mi˺ [dišeššana-ip] And Darius the king says: For that reason, we call (our) family Achaemenids. From long ago, (we) have been noble, and from long ago our family has been kings. par. 4 ˹a-ak diš˺da-ri-˹ia-ma˺-[u]-iš diš˹eššana˺ na-an-ri 8 dišeššana-ip dišnumun-meš dišu2-ni-na ap-pu-[ka4] dišeššana-me mar-ri-iš ˹dišu2 9-um˺-[me-ma dišeššana-me] ˹ḫu-ud-da ša2-ma-ak-mar˺ dišnu-˹ku dišeššana-ip˺-u2-ut And Darius the king says: 8 kings in my family formerly held the kingship. I held the 9th kingship. One after the other, we were kings. par. 5 a-ak dišda-ri-ia-ma-u-iš dišeššana na-an-ri za-u-˹mi-in˺ [du]-˹ra˺-[maš-da-na diš]˹eššana-me dišu2 ḫu-ud˺-da du-˹ra-maš-da˺ diš˹eššana-me diš˺u2 du-nu-iš And Darius the king says: (By) the intercession of Ahuramazda, I exercised kingship. Ahuramazda bestowed kingship upon me. par. 6 a-ak dišda-ri-ia-ma-u-iš dišeššana na-an-ri diš˹da˺-[a]-˹ia˺-[u-iš ḫi ap-pa] ˹dišu2-ni-na ti˺-ri-iš-˹ti za-u-mi-in du-ra˺-maš-da-na dišu2 dišeššana-me ap-pi-ni ḫu-ud-[d]a dišbar-šipx a-ak dišḫa-˹tam5˺-[tup a-ak dišba-pi-li-i]p ˹a-ak dišaš2˺-šu-ra-˹ip a˺-[ak dišḫar]-˹ba-ia˺-ip a-ak dišmu-iz-za-ri-ia-ip a-a[k] diš.dkam-meš-ip a-ak diš˹iš˺-[par2-ti-ia-ip a]-˹ak diši-ia-u˺-na-ip a-˹ak diš˺[ma]-˹da-be a-ak˺ dišḫar-mi-nu-ia-ip a-ak diška4-at-˹ba˺-du-kaš-be a-ak dišpar2-tu-˹ma˺-[ip a-ak dišsir-ra]-˹in-kaš-be a-ak˺ dišḫa-ri-˹mi-ia˺-[ip a]-˹ak dišma˺-raš2-mi-ia-ip a-ak dišba-ak-ši-iš a-ak diššu-ug-taš-be a-˹ak˺ [dišba-ir-ra?-u2?-pa/ba? ]-˹ri?-sa-na a-ak˺ dišša2-ak-˹ka4-be a-ak˺ [diš]˹sa-ad-da˺-ku-iš a-ak dišḫar-ra-u-ma-ti-iš ˹a˺-ak dišma-ak-ka4 PAP ir tar-˹tin˺-[na 23 dišda-a-ia-u]-˹iš˺ And Darius the king says: These (are) the nations who called (themselves) mine (and, by) the intercession of Ahuramazda, I placed kingship over them: The Persians, and the Elamites, and the Babylonians, and the Assyrians, and the Arabians, and the Egyptians, and the Sea-People, and the Sardians, and the Ionians, and the Medes, and the Armenians, and the Cappadocians, and the Parthians, and the Drangians, and the Areians, and the Chorasmians, and Bactrians, and the Sogdians and Parauparisana(? ), and the Scythians and Sattagydia and Arachosia and Maka, a grand(?) total (of) 23 nations. par. 7 ˹a-ak˺ dišda-˹ri-ia˺-[ma-u]-˹iš dišeššana na˺-an-ri dišda-a-ia-u-iš ḫi ap-pa dišu2-ni-na ti-ri-iš-ti za-u-mi-˹in˺ [du-ra-maš-da-na] ˹daš li-ba-me dišu2˺-ni-na ˹ḫu-ud-da-iš˺ [ba-zi2]-˹iš˺ dišu2-ni-na ku-ti-iš ap-pa dišu2 dišap ti-ri-ia dši-ut-ma-˹na˺ [dna-a-ma-na-ma ḫu]-˹uḫ-be ḫu-ud-da˺-iš And Darius the king says: These nations who call (themselves) mine, (by) the intercession of Ahuramazda, performed service unto me, brought me tribute, (and) whatever I commanded them, night and day, they accomplished. par. 8 ˹a-ak dišda˺-[ri]-˹ia-ma˺-u-iš dišeššana na-an-ri dišda-a-ia-[u]-iš ḫi ḫa-ti-ma dišlu2-meš-ir-˹ra˺ [diš?ak?-ka4? diš?kur?-ma?-x-x ḫ]u -˹pir2-ri ir ku˺-uk-ti ˹ak-ka4 dišḫal-la-ma˺-ir ḫu-pir2-ri šil-la-ka4 mi-ul-e ḫa-˹pi˺ za-u-mi-in du-ra-maš-˹da˺-[na da-ad?-da? dišu2]-˹ni-na dišda-a˺-ia-u-˹iš ḫi ḫa-ti-ma ku-uk˺-da-ak ap-pa an-ka4 dišu2-ik-ki-˹mar˺ ap ti-ri-ik-ka4 ḫu-uḫ-be ˹ḫu-ud˺-[da-iš] And Darius the king says: Throughout these nations, the man who(?) was(?) …, him (I) upheld; whoever injured, him greatly (I) investigated. (By) the intercession of Ahuramazda, my law was upheld throughout these nations; whatever I commanded, that they accomplished. par. 9 ˹a-ak dišda-ri˺-ia-ma-˹u-iš dišeššana˺ [na-an]-˹ri d˺u-ra-maš-da ḫi dišeššana-me diš˹u2 du˺-nu-iš a-ak du-ra-maš-da pi-˹ik˺-[ti dišu2 da-iš ku]-˹iš dišeššana-me ḫi˺ šil-la a-˹ak za-u-mi˺-[in d]˹u-ra˺-maš-da-na dišu2 dišeššana-me mar-r[i]-˹ia˺ And Darius the king says: Ahuramazda gave me this kingship and Ahuramazda sent me aid, until (I) strengthened this kingship, and (by) the intercession of Ahuramazda, I held kingship. par. 10 a-ak dišda-ri-ia-˹ma-u˺-[iš dišeššana na-an-ri] ˹ḫi ap-pa dišu2˺ ḫu-ud-˹da za˺-[u]-˹mi-in du-ra-maš˺-da-na me-ni sa-ap ap-pa [dišešša]na-me du-ma diškan2-bu-zi2-ia ˹ḫi˺-[še dišku-raš2 dišša2-ak-r]i ˹dišnumun-meš dišnu-ka4˺-mi ḫu-˹pir2-ri ša2?-aš2-ša2? aš?ma-ad˺-da dišeššana-me mar-ri-iš diš˹kan2˺-[bu]-zi2-ia ḫu-pir2-ri diši-gi-˹ri˺ [dišbir3-ti-ia ḫi-še] ˹daš da-ma a-ak˺ fam-˹ma ad-da i-da˺-ak a-ak diškan2-bu-zi2-˹ia˺ ḫu-pir2-ri dišbir3-ti-ia ir ḫal-pi-˹iš sa˺-[ap diškan2-bu-zi2-i]a ˹dišbir3-ti-ia˺ ir ḫal-˹pi-iš dištaš˺-[šu]-˹ip2 in-ni˺ tur-na-iš ap-p[a] dišbir3-ti-ia ḫal-pi-ka4 me-ni diškan2-bu-zi2-ia dišmu-˹iz-za˺-[ri-ia-ip-ik]-˹ki pa-ri-iš˺ me-ni ˹dištaš-šu-ip2 mi-ul?-ka4˺-iš ku-ud-da ˹ti-ut˺-ki-me dišda-a-ia-u-iš ḫa-ti-ma ir-še-˹ik-ki ḫu?˺-[ud?-tuk? ku-ud-d]a ˹dišbar-šipx-ik-ki˺ ku-ud-˹da dišma-da-be-ik-ki˺ a-ak ku-ud-da dišda-a-ia-u-iš ap-pa da-a-e ḫa-ti-ma ˹a-ak˺ [me-ni dišlu2-meš ki]-˹ir dišma-ku-iš diš˺kam-˹ma-ad-da ḫi-še ḫu-pir2-ri˺ ašna-aš2-i[r-ma] aškur-meš ašḫa-rak2-ka4-tar-ri-iš ḫi-še ḫa-mi-˹mar˺ [14? d?na?-an? d]˹iti-meš dmi-kan2-na˺-iš-˹na pi-ir-ka4˺ [ḫi zi2]-˹la i˺-ma-ka4 ḫu-˹pir2˺-[ri] ˹diš˺taš-šu-ip2 dišap ir ti-tuk-ka4 na-an-ri dišu2 diš˹bir3-ti˺-[ia dišku-raš2 dišdumu-ri] ˹diškan2-bu-zi2˺-ia ˹diši-gi˺-[ri ma]-˹ra me-ni˺ dištaš-šu-ip2 mar-ri-da diškan2-bu-zi2-ia-ik-ki-mar ˹be˺-[ip-ti-ib-ba ḫu-pir2]-˹ri-ik-ki pa˺-ri-˹iš ku-ud-da˺ [diš]˹bar-šipx a-ak˺ ku-ud-[d]a dišma-da-be a-ak ku-ud-da dišda-a-ia-u-iš ˹ap-pa da˺-[a-e a?-ak? diš]˹eššana-me ḫu-pir2-ri˺ mar-˹ri-iš 9 dna-an d˺iti-meš dkar-ma-bad-taš-na pi-ir-ka4 ḫi zi2-la diškan2-bu-zi2-˹ia ir˺ [mar?-ri?-iš?/ik? a]-˹ak me-ni diškan2-bu˺-zi2-˹ia ḫal-pi du- ḫi-e-ma ḫal˺-pi-ik And Darius the king says: This is what I did (by) the intercession of Ahuramazda, after (I) received the kingship. Cambyses by name, Cyrus, his son, of our family, formerly(?) (and) here, he held kingship. That Cambyses, his brother, Smerdis by name, with (the same) mother (and) father, that Cambyses killed Smerdis. When Cambyses killed Smerdis, the people didn’t know that Smerdis was dead. Then Cambyses went to Egypt. Then the people caused destruction; furthermore, the lies grew throughout the nations, both in Persia and in Media, and throughout other nations. And then, a man, a Magus, Gaumata by name, he, from Naširma, a mountain, Harakkatarriš by name, from there 14 days of the month Mikannaš had passed, thus (he) rose up. He lied to the people: “I am Smerdis, Cyrus’ son, Cambyses’ brother.” Then all the people rebelled against Cambyses and went (over) to him, both the Persians and the Medes, and the other nations and(?) he held kingship. 9 days of the month of Karmabataš had passed, thus (the kingship) was seized(?) from Cambyses. And then Cambyses died of natural causes. par. 11 a-ak dišda-ri-ia-ma-u-iš dišeššana na-an-˹ri dišeššana-me˺ [am-min2?-nu? ap]-˹pa diškam-ma-ad˺-da ˹ak-ka4 dišma˺-[ku]-˹iš diš˺kan2-bu-zi2-ia e-mi du-iš-ti dišeššana-me am-min2-nu ka4-ra-˹da-la-ri˺ [dišnumun-meš dišnu-ka4]-˹mi daš me-ni diš˺kam-ma-˹ad-da ak-ka4 dišma˺-ku-iš diškan2-bu-zi2-ia e-mi du-iš ku-ud-da dišbar-šipx a-˹ak ku˺-[ud-da dišma]-˹da-be a-ak ku-ud˺-da ˹dišda-a-ia˺-[u]-˹iš ap˺-pa da-a-e ḫu-pir2-ri e-mi du-ša2 du-man-e ḫu-ut-taš diš˹eššana-me˺ [ḫu-pir2-ri mar]-˹ri-iš˺ And Darius the king says: This kingship that Gaumata the Magus took away from Cambyses, this kingship for a long time belonged to our family. Accordingly, Gaumata the Magus took it away from Cambyses, both the Persians and the Medes and the other nations, he took them away from him and made (them) his possessions. He held kingship. par. 12 ˹a-ak dišda-ri-ia-ma-u-iš˺ dišeššana ˹na˺-an-ri dišlu2-meš-ir-ra in-na ša3-ri ˹in!˺-[ni ki?-ri? in-ni diš]˹bar-šir8-ra in˺-ni ˹dišma-da a-ak in-ni dišnumun˺-meš dišnu-ka4-mi ak-ka4 diškam-ma-ad-da dišma-ku-iš dišeššana-me ˹e-mi du˺-[man?-ra? diš]˹taš-šu-ip2 šil-la˺-ka4 ir ip-ši-˹iš dištaš-šu-ip2 ir˺-še-ik-ki ˹ḫal˺-pi-iš dišak-ka4-be ša2-aš2-ša2 dišbir3-ti-ia ir tur-na-iš-˹ti ḫu-be˺ [in-tuk-ki]-˹me dištaš-šu-ip2 ir-še˺-ik-˹ki ḫal-pi-iš˺ [a]-˹nu dišu2 ir˺ tur-na-˹um˺-pi ap-pa dišu2 in-ni dišbir3-ti-ia ak-ka4 dišku-˹raš2 dišša2-ak-ri a-ak dišak-ka4-ri aš2˺-ki diš˹kam-ma-ad-da dišma-ku-iš˺ tu-˹ba˺-ka4 in-ni li-ul-ma-ak ku-iš dišu2 ši-in-˹nu-gi-ut me˺-[ni dišu2 du]-ra-maš-da bat-ti˺-ia-man-˹ia-a du-ra-maš-da˺ pi-˹ik-ti diš˺u2 da-iš za-u-mi-in du-ra-maš-da-na 10 ˹dna-an˺ [diti-meš d]˹ba-gi-ia-ti˺-iš-na pi-˹ir-ka4 ḫi zi2-la dišlu2-meš˺ḫ[a]-˹ri˺-ki-ip i-da-ka4 dišu2 diškam-ma-ad-da ˹ak-ka4 dišma˺-[ku-iš ir] ˹ḫal-pi-ia ku-ud˺-da dišlu2-˹meš ap-pa ḫa-tar-ri-man-nu da˺-[mi] ˹ḫu˺-pa-ip-pi i-da-ka4 ašḫu-ma-nu-iš ašši-˹ik˺-[ka4-ia?-ma?-ti?-iš] ˹ḫi-še ašnu˺-iš-ša2-ia ḫi-še aš˹da-a-ia-u2˺-iš ˹diš˺[ma]-˹da˺-be-ik-ki ḫa-mi ir ḫal-pi-ia dišeššana-me dišu2 ˹e-mi du˺-[ma za-u-mi]-˹in du-ra-maš˺-da-na diš˹u2 dišeššana-me ḫu-ud-da du˺-[ra]-˹maš˺-da dišeššana-me dišu2 du-nu-iš And Darius the king says: There was no man, no-one(? ), not a Persian or a Mede or (anyone else) from our family, to retrieve kingship from Gaumata the Magus. The people greatly feared him. (He) slaughtered the people, (those) who formerly knew Smerdis. For that reason (he) slaughtered the people: lest (they) know me that I am not Smerdis, Cyrus, his son and no-one (with) anything related to Gaumata the Magus came forth, until I came. After that I prayed to Ahuramazda. Ahuramazda sent me aid. (By) the intercession of Ahuramazda, 10 days of the month of Bakeyatiš had passed, thus with a few men I killed Gaumata the Magus and his accompanying men, his foremost followers, in a fortress, Šikkayamatiš by name, (in) Nušaya by name, a district in Media, there I killed him and I took away his kingship. (By) the intercession of Ahuramazda, I held kingship. Ahuramazda gave me kingship. par. 13 a-ak ˹dišda˺-[ri-ia-ma-u-iš diš]˹eššana na-an-ri diš˺eššana-me ˹ap-pa dišnumun-meš˺ [dišnu]-˹ka4-mi-ik˺-[ki]-mar ku-ut-ka4-la ir-rak2-ki ḫu-be dišu2 tin-gi-˹ia dišu2˺ [ka4-te-ma zik-ki]-˹da sa-ap˺ ap-pa an-˹ka4 ap-pu˺-[ka4]-˹da ḫi zi2-la˺ [a?-ak?] dišu2 dzi2-ia-an dna-ap-pan-na ḫu-˹ud-da ap-pa˺ [diškam-ma-ad-da] ˹ak-ka4 diš˺ma-ku-iš ˹sa-ri-iš˺-[da a]-˹ak dišu2˺ [dištaš]-˹šu˺-ip2-na lu-taš a-ak aš2 a-ak diškur-taš a-˹ak ašul-ḫi-meš˺ [x-x-x]-˹ma ap˺ pi-li-ia ˹ap-pa diškam-ma-ad-da ak˺-[ka4] ˹diš˺ma-ku-iš e-ma-ap du-iš-da a-ak dišu2 ˹dištaš-šu-ip2˺ [ka4-at?-te-ma] ˹zik-ki˺-da ku-ud-da ˹dišbar-šipx a-ak ku-ud-da dišma˺-da-be a-ak ku-ud-da dišda-a-ia-u2-iš ˹ap-pa da˺-[a-e ku?-ud? ]-˹da ḫi zi2˺-la sa-ap ap-˹pa an-ka4 ap-pu-ka4-da dišu2 ap˺-pa ku-ut-ka4-la ir-rak2-ki ḫu-be tin-gi-ia za-˹u-mi˺-[in du-ra-maš]-˹da˺-na ḫi dišu2 ḫu-ud-˹da dišu2 ba-li-ik-me za˺-[u2? ]-˹ma˺ ku-iš ašul-ḫi-meš dišnu-ka4-mi aška4-te-ma zik-˹ki-da˺ [ḫi zi2-la sa]-˹ap ap˺-pu-ka4-da a-ak diš˹u2 ba-li-ik-me za˺-[u2?-ma za]-˹u˺-mi-in du-ra-maš-da-na ap-pa diškam-ma-ad-˹da˺ [ak-ka4 dišma-ku-iš] ˹ašul˺-ḫi-meš dišnu-ka4-mi in-ni ku-˹ut-kal3 ir-ra˺-[iš?-da?] And Darius the king says: The kingship that had been taken away from our family, that I brought back and I set it in its place as it was formerly. Accordingly, and(?) I made the temple(s) of the gods that Gaumata the Magus had destroyed, and I restored to the people, to them, pasture lands(?) and herds and workers and all(?) houses, that Gaumata the Magus had taken away from them, and I placed the people in their (rightful) place, both the Persians and the Medes and the other nations, and(?) accordingly as it was formerly. I, what had been taken away, that I brought back. (By) the intercession of Ahuramazda, this I did. I exerted effort until (I) restored our house as it was formerly and I exerted effort, (by) the intercession of Ahuramazda, such that Gaumata the Magus hadn’t taken away our house. par. 14 a-ak dišda-ri-ia-ma-u-iš dišeššana na-an-ri ˹ḫi ap-pa˺ [dišu2-ni-na] ˹ḫu-ud-da˺-ak sa-ap ap-˹pa an-ka4 ap-pu-ka4 dišeššana-me mar˺-ri-ia This is what was accomplished by me as formerly (I) held kingship. par. 15 a-ak dišda-ri-ia-˹ma!-u-iš dišeššana na-an-ri sa-ap diškam˺-ma-ad-da ˹ak-ka4 dišma-ku-iš dišu2˺ [ir?] ˹ḫal˺-pi-ia me-ni dišḫa-iš-ši-na ḫi-še dišḫa-tam5-˹tur-ra dišuk-ba-tar-ra-an-ma(! )˺ dišša2-ak-ri ḫu-˹pir2-ri diš˺[ḫa]-˹tam5-tup-ik-ki˺ i-ma-ka4 na-an-ri dišeššana-me dišḫa-tam5-tub-be diš˹u2 ḫu-ud-da ma-ra me-ni diš˺ḫa-˹tam5-ti˺-ip dišu2-ik-˹ki!-mar be-ip-ti-ib˺-[ba diš]˹ḫa˺-iš-ši-na ḫu-pir2-ri-ik-ka4 pa-ri-iš ˹me-ni dišeššana˺-[me] ˹ḫu-pir2-ri˺ dišḫa-tam5-ti-ip-na ˹ḫu-ud-taš a-ak ku˺-[ud-da] ˹diš˺ru-uḫ ki-ir dišnu-ti-ut-be-ul ḫi-še diš˹ba-pi-li-ir-ra dišḫa-a-na-a˺-ra dišša2-˹ak-ri˺ [ḫu]-˹pir2-ri ašba-pi˺-[li] ˹i-ma-ka4 dištaš-šu-ip2-be ḫi zi2-la ap-pi ˹ir ti-tuk-ka4 na-an-ri diš˺u2 dišnab-ku-tur-ru-˹sir˺ [diš]˹dumu nab-bu-ni-da-na˺ [me]-˹ni˺ dištaš-šu-ip2 ap-pa dišba-pi-li-ip mar-ri-˹da dišnu-ti-ut-be-ul ḫu-pir2˺-ri-ik-ki ˹pa-ri-iš me-ni dišba-pi-li-ip be˺-ip-ti-ip dišeššana-me ap-pa dišba-pi-li-ib-be ḫu-˹pir2-ri mar-ri-iš˺ And Darius the king says: When I killed Gaumata the Magus, then Hašina by name, an Elamite, Ukbatarranma, his son, rose up in Elam (and he) said: I held kingship of the Elamites. Then the Elamites rebelled against me and went (over) to that Hašina. Then he held kingship of the Elamites and, one man, Nidintu-Bēl by name, a Babylonian, Hanara, his son, rose up in Babylon and (to) the people, (as well), thus, to them lied (and) said: I (am) Nebuchadnezzar, son of Nabonidus. Then all the Babylonian people went (over) to that Nidintu-Bēl. Then the Babylonians rebelled. He held kingship of the Babylonians. par. 16 a-ak diš˹da-ri-ia-ma-u-iš dišeššana na˺-an-ri me-ni dišu2 dišḫu-ut-lak ḫa-tam5-tup-˹ik-ki tin-gi-ia dišḫa˺-iš-ši-na ḫu-pir2-˹ri mar-ri-ka4 rab2-ba-ka4 dišu2-ik˺-ki tin-gi-ik me-ni dišu2 ir ḫal-pi And Darius the king says: Then I sent a messenger to Elam that Hašina be seized, and in shackles (he) was brought back to me. Then I killed him. par. 17 ˹a-ak dišda-ri˺-ia-ma-u-iš dišeššana na-˹an-ri me-ni dišu2 ašba-pi-li pa-ri˺-ia dišnu-ti-ut-be-ul ḫu-pir2-ri-ik-ka4 ak-˹ka4 na-an-ri dišu2 dišnab-ku-tur˺-ru-sir diš˹taš-šu-ip2 ap-pa dišnu-ti-ut-be-ul ḫu-pir2˺-ri-na aša-meš ašti-ig-ra ḫi-še ḫa-mi ˹be-sa-ib-ba? ašti-ig˺-ra ašša3-ri-˹ut mar-ri-iš ku-ud-da aša-meš˺ [ḫu? ]-uḫ-be gešma2-meš-na me-ni dišu2 dištaš-šu-˹ip2 maš-ka4-um-ma˺ [ḫa]-˹zik-ka4 ap˺-pa-pa anše-a-˹ab-ba-meš-ma ap-pi-in be-ib-la ap-pa-pa˺ anše-kur-ra-meš ir be-ib-li-ib-˹ba du-ra-maš-da pi-ik-ti diš˺u2 da-iš za-˹u-mi-in du-ra-maš-da-na ašti-ig˺-ra an-la-gi-u2-ut-ta ḫa-mi dištaš-˹šu-ip2 ap-pa dišnu-ti-ut-be-ul ḫu-pir2-ri-na˺ ḫal-pi-˹ia 26 dna-an diti-meš d˺[ḫ]a-iš-ši-ia-ti-ia-iš-na pi-ir-ka4 ˹ḫi zi2-la ša2-par2-rak2-um-me ḫu-ud˺-da-ḫu-˹ut ir-še-ik-ki dištaš-šu-ip2˺-[e? ḫa? ]-˹mi˺ ḫal-pi And Darius the king says: Then I went to Babylon, to that Nidintu-Bēl, who said: I (am) Nebuchadnezzar. The troops of that Nidintu-Bēl, at the river Tigris by name, there, were deployed(?) and seized the bank(?) of the Tigris and that river was navigable. Then I supplied the troops with leather-skins; (another) remaining group (I) placed on camels, (for another) remaining group, horses were assigned. Ahuramazda sent me aid. (By) the intercession of Ahuramazda, (we) went across the Tigris there; (I) killed the troops of that Nidintu-Bēl. 26 days of the month Hašiyatiyaš had passed, thus (we) made battle. (I) killed many of his(?) troops there. par. 18 a-ak dišda-ri-ia-ma-u-iš dišeššana ˹na-an-ri me-ni˺ [diš]˹u2 ašba-pi-li˺ pa-ri-ia ˹šu-tur ašba-pi˺-[li] ˹in-ni li˺-i[p]-˹pu˺-gi-ud-da ašḫal-meš ašza-iz-za-an ḫi-˹še ašu2-ip-ra˺-[d]u-˹iš da-ma da-ak˺ ḫa-˹mi dišnu-ti-ut˺-[be-ul] ˹ḫu-pir2-ri ak-ka4˺ na-an-ri dišu2 dišnab-ku-tur-ru-˹sir dištaš-šu-ip2 i-da-ka4 ir˺-ru taš ši-˹in-nu-ik ša2-par2-rak2-um˺-[me ḫ]u-ut-ti-man-ra me-ni ša2-par2-rak2-um-me ḫu-ud-da-˹ḫu-ud du-ra-maš-da pi˺-ik-ti dišu2 da-˹iš za-u-mi-in du-ra˺-[maš]-da-na dištaš-šu-ip2 ap-pa dišnu-ti-ut-be-ul ḫu-˹pir2-ri-na ḫa-mi ḫal-pi-ia 2 dna˺-an diti-meš ˹dḫa-na-ma-ak-kaš-na pi-ir˺-[ka4] ˹ḫi˺ zi2-la ša2-par2-rak2-um-me ḫu-ud-da-ḫu-ut dištaš-šu-˹ip2 ap-pa dišnu-ti-ut-be-ul-na dišu2 ḫal˺-pi ir-še-ik-˹ki a-ak ap˺-[pa aš]˹a-meš-ma pu-ud˺-da-na aša-meš ḫi-ma ša2-sa-ak And Darius the king says: Then I went to Babylon. Before I arrived in Babylon, a town, Zazzan by name, situated on the Euphrates, there that Nidintu-Bēl, who said: I (am) Nebuchadnezzar, attacked me together with troops in battle. Then (we) made battle. Ahuramazda sent me aid. (By) intercession of Ahuramazda, (I) killed the troops of that Nidintu-Bēl there. 2 days of the month Hanamakaš had passed, thus we made battle. I slaughtered many of the troops of Nidintu-Bēl, and (others) who were fleeing to the river were carried away by this river. par. 19 a-˹ak dišda-ri-ia-u-iš dišeššana na-an˺-ri me-ni ˹dišnu-ti-ut-be-ul ḫu-pir2-ri˺ [diš]˹te-ul˺-nu-ip ḫa-ri-ki-ip i-da-ka4 pu-ut-˹tuk-ka4 sa-ak ašba-pi-li li-ip-ka4 me˺-ni dišu2 aš˹ba-pi-li mi-du-gi-ud-da˺ [za]-˹u-mi˺-in du-ra-maš-da-na ku-ud-da ašba-pi-˹li mar-ri-ia ku-ud-da dišnu-ti-ut˺-be-ul ḫu-˹pir2-ri ir mar-ri me-ni dišnu-ti˺-ut-be-ul ḫu-pir2-ri dišu2 ašba-pi-li ir ḫal-˹pi˺ And Darius the king says: Then that Nidintu-Bēl together with several horsemen fled and went to Babylon. Then I went forth to Babylon and (by) the intercession of Ahuramazda, (I) seized Babylon and that Nidintu-Bēl. Then I killed that Nidintu-Bēl in Babylon. 1. Restoration of ˹dišḫa-ak˺-[ka4-man]-˹nu-iš-ši˺ia “Achaemenid” matches the photographs. Therefore, the earlier dišḫa-ak-[ka4-man-nu]-ši-ia is to be corrected (JA 281, 20). Such a variant writing of this name appears in other AE texts (see PFT 687). 1. dišḫa-ri-˹mi-ia˺-[ip] “Areians.” Detailed examination of the photographs shows that the sign following ri is indeed mi. Therefore, the earlier dišḫa-ri-i-ia-i[p] or dišḫa-ri-ia-i[p] has been corrected (see JA 281, 21 and PFT 692). The new reading gives us Ḫarimiap and corresponds to OP Ḫaraiva and Bab. kura-ri-e-mu (see CII 1/1/1, 49 and CII 1/2/1:12). Presumably this name is the plural of Ḫarimia “(an) Areian” and could be connected to such names as ḫa-ri-ma, ḫar-ri-ma or ḫar-ru-ma in AE texts that all imply Areia (see PFT 691f). 2. The reading of [dišba-ir-ra?-u2?-ba/pa? ]-˹ri?-sa-na˺ is suggested for earlier [dišpar2-ru-ba-ra-e]-sa-na (KT 1907: 96). Only the two final signs of this name are wholly legible, and a preceding trace is partially visible. Other signs are lost. The OP correspondence of this name is completely different (Gandāra) (see CII 1/1/1, 50). Presumably, KT’s reading is based on Bab. kurpa-ar-u2-pa-ra-e-sa-an-na (CII 1/2/1, 12). But as far as photographs show, the trace before >-sa-na does not resemble e, but ri could match it. Moreover, a visible tip at the beginning of the discussed name does not resemble any wedges of par2 but is very much like the lower horizontal wedge of ba. Assuming a correlation between Elamite and Babylonian forms of the name, the new restoration could match the photographs. This restoration suggests the term Barrauparisana or Barraubarisana. It should be mentioned that in PF-NN 944: 10-11 a geographical name ašba-ra-u2-ba-ra-e-za-na is attested, that could represent Barubarezana. If this name is connected to OP Gandāra, the new suggestion would be more compelling. 1. An examination of the photographs shows that a phrase was intended, all of whose signs are quite eroded, corresponding to OP ḫya agriya āḫa “(the man) who was loyal,” Bab. pi-it-qu-du, “trustworthy (man)” (see CII 1/1/1, 50 and CII 1/2/1, 12, 54). Seemingly, this phrase is comprised of two terms. One might be the relative pronoun ak-ka4 “who” corresponding to OP ḫya (see Paper 1955: 91 and CII 1/1/1, 50), while the other should be a term carrying the meaning “loyal, trustworthy” or “faithful” and comprises three or four signs. In current AE texts, no such a term exactly matches the mentioned meanings. Although in Middle and neo-Elamite texts there are a number of terms such as ḫa-mi-it, ḫa-mi-ti and ḫi-ši-ir, that are usually interpreted as “trustworthy, loyal” or “faithful” (EIW 614 & 671), none of them match the photographs. Perhaps the relevant term is connected to a stem kurma- “to entrust” (see PFT 10). Insofar as the Persepolis texts are concerned, it is suggestive of a semantic relationship between kurma- and OP agria āḫa, and Bab. pi-it-qu-du. 2. In 1993, Grillot-Susiny et al. suggested the restoration as ḫal-lu-ma-ir instead of Weissbach’s [ḫa-ri]-˹ik˺-kan2 (see JA 281, 21 and VAB 3, 12). Putting aside lu, their restoration is correct. In 2015, I proposed that Weissbach’s restoration is incorrect and suggested ˹dišḫal-la-ma˺-ir instead (see Parian 2015: 2-3). Using Hallock’s terminology, this restoration, a variant writing of ḫal-lu-ma-ir that demonstrates the form hallamar, is a conjugation Im participle of a verb ḫalla- (cf. ḫallu-) and means “injurer” (see PFT 688). It should be mentioned that in 2015, Aliyari also suggested ˹ḫal?-la?˺[-ma? ]˹-ir?˺ for the discussed term (see Aliyari 2015: 105). 3. da-ad?-da? “law.” This restoration is suggested for the earlier da-ad-tam6 (see JA 281, 21). In the royal AE inscriptions, the term used to mean “law” as a loanword from its OP correspondence, connected to data-. In AE texts, variant writings such as da-at-tam6, da-ad-da-um, da-ad-da and da-tam5 appear (see PFT 681). Therefore, considering dātā in the OP version of Behistun (see CII 1/1/1, 50), it is more rational to restore da-ad-da than da-at-tam6 in the Elamite version. 4. Aliyari’s ḫa-ti-ma is absolutely correct (Aliyari 2015: 105) and detailed examination of the photographs substantiates the writing of ma following ḫa-ti. Therefore, the earlier ḫa-ti is to be corrected (see JA 281, 21 and PFT 694). It seems that ḫatima (or ḫatuma) had been an expression used to mean “in, into” or “throughout.” In AE texts, especially in Behistun, ḫa-ti-ma frequently appears (see PFT 694 & 695). 1. du-ra-maš-da pi-˹ik˺-[ti dišu2 da-iš ku]-˹iš dišeššana-me ḫi˺ šil-la “Ahuramazda sent me aid until I strengthened this kingship.” This reading matches the photographs, and examination of this line substantiates the writing of šil-la. Therefore, the earlier be-la is to be corrected (see JA 281, 21). The new reading demonstrates the form šilla that is a conjugation I form of šilla- “to strengthen.” Derivations from this stem appear in Middle and neo-Elamite texts (see EIW 1162-1163). Some derivations from šilla- (zilla- in Hallock’s glossary) are also attested in AE texts (see PFT 774). 1. The reading of ḫu-˹pir2-ri ša2?-aš2-ša2? aš?ma-ad˺-da dišeššana-me mar-ri-iš is suggested for the earlier ḫu-pirsic!-r[i …]-la-da or ḫu-˹pir2˺[-ri ap]˹-pu-+kade˺-da (see JA 281, 22 and Aliyari 2015: 106). As the examination of the pertinent line shows, the trace which the previously assumed as la or kade is indeed ad. Moreover, it seems that the preceding visible traces are of pir2, ri, aš2 and ma. In fact, the last three of them are the same that KT recorded in a footnote of their edition (see KT 1907:99). Restoration of ša2?-aš2-ša2? aš?ma-ad-da matches the photographs. This suggestion demonstrates the Elamite šašša madda that means “formerly, here.” Therefore, the sentence could be translated as: “He formerly held the kingship here.” This sentence matches the OP and Bab. correspondences. It is well known that ša2-aš2-ša2 “formerly” in AE texts and ašma-ad-da “here” also appear in XPb14 (see PFT 722 & 755). 3. In 2015, I discussed the new suggestion of ˹mi-ul?-ka4˺-iš instead of the earlier ḫa-[ri-ik]-ka4-iš (see Parian 2015: 3). The new suggestion demonstrates the term milkaš that could be a conjugation I of a stem milka-. Although it does not seem that milka- appears in other AE texts (see PFT glossary), referring to discussion in 2015, it seems that there is a close semantic relationship between milka- and stem ḫalla- that appears in §8. Presumably, the new reading is relevant to forms such as mi-ul-ka4-man-ra, mi-ul-ka4-na and mi-ul-ka-ša2 in a number of neo-Elamite texts (see EIW 942). Since Grillot & Vallat translated milka- as “to destroy” (see JA 258, 223; JA 263, 215; EIW 942), milkaš is translated as “(they) destroyed” or “(they) brought about destruction.” Therefore, the discussed sentence (meni taššup milkaš) is translated as “then the people destroyed/brought about destruction”). This sentence is well correlated with OP and Bab. correspondences. It should be added that milkaš is a conjugation I form of a verb milka- and is transitive, but the mentioned sentence has no direct object and it remains questionable. However, Hallock has discussed the appearance of such cases. In his opinion, it is possible to assume that the object is simply omitted (see JNES 18, 4). 5. Restoration of [me-ni dišlu2-meš ki]-˹ir˺, “then a man,” is suggested for previous [me-ni dišru-uḫ ki]-ir (see JA 281, 22). Considering the dimensions of wedges, the examination of the photographs shows that with the writing of dišlu2-meš as a logogram for “man,” spaces between restored signs would be similar to spaces between other signs in the line. But the writing of dišru-uḫ yields much less spaces between them. Regarding style of signs in §§8-16, wherever the term “man” is used, the scribe writes dišlu2-meš rather than dišru-uḫ. 7. According to the photographs, a restoration of dišu2 diš˹bir3-ti˺-[ia dišku-raš2 dišdumu-ri] “I (am) Smerdis son of Cyrus” matches the photographs. But there is not enough space to write [dišku-raš2 dišša2-ak-ri] as previously assumed (JA 281, 22). 8. A reading of …˹ap-pa da˺-[a-e a?-ak? diš]˹eššana-me ḫu-pir2-ri˺ mar-˹ri-iš˺ “… which (are) other and(?) he (Gaumāta) held the kingship” is suggested. In a footnote to their edition, KT correctly mentioned that there is space for just two signs after ˹da˺-[a-e] at the heavily damaged part of the inscription (see KT 1907: 101). In 2015, Aliyari suggested me-ni “then, after that” to fill this gap (Aliyari 2015: 106). Apparently, using me-ni “then, after that” is correct (see PFT 729) to indicate sequence of two events (here the people rebelling against Cambyses and then Gaumāta holding the kingship). But comparing this with OP corresponding phrases, it seems that the writing of a-ak “and” would be more convincing than me-ni. In the OP correspondence phrase, the term pasāva which generally corresponds to AE meni doesn’t appear (see Paper 1955: 110), while the implicit concept of “and” is deduced. Therefore, a meaning of “…(and) he held the kingship” is convincing. As Paper mentioned, a-ak “and” occurs very frequently both to introducing a phrase and in a series of nouns and phrases (Paper 1955: 107). 1. A new reading of ˹dišeššana-me˺ [am-min2?-nu? ap]- ˹pa˺... corresponds to OP aita xšaçam taya … “this kingship that…” (see CII 1/1/1, 52). As photographs show, the sign following me is am and it matches the visible faint trace. Moreover, there is space for two signs between am and [ap]-˹pa˺ “which, that.” Therefore, the earlier dišeššana-me [ḫu-be …] “that kingship” or dišeššana-me [ḫi …] “this kingship” should be corrected (see KT 1907: 101 and JA 281, 23). The term am-min2-nu demonstrates amminnu “this (same)” (see PFT 666) that corresponds to OP aita “this” (see CII 1/1/1, 52). The phrase dišeššana-me am-min2-nu is also repeated” in §11, exactly corresponding to OP aita xšaçam (ibid.). 1. dišlu2-meš-ir-ra in-na ša3-ri ˹in!˺-[ni ki?-ri? in-ni diš]˹bar-šir8-ra˺… “There was no man, no one(? ), not a Persian … .” Removal of tufa has revealed faint traces in the quite eroded section of the text. Accordingly, assuming uttara (ḫuttara) as a variant of a verb ut- (normally written ḫu-ut/d), Cameron suggested a restoration of ut-ta-ra (see JCS 14, 63). He translated in-ni ut-ta-ra as “not any actor,” in correspondence to OP kašçi (see ibid.). However, such an interpretation is ambiguous. uttara (ḫuttara) could be a conjugation I participle of hutta- which means “doer, maker,” or as Cameron wrote “actor” (see ibid. ), and no semantic relationship between it and OP kašçi “one” can be located. In fact, in the OP version, kašçi is repeated in this paragraph whose Elamite correspondence is clearly dišak-ka4-ri (=akkari). Despite Hallock’s translation of akkari as “anyone, no one” (with negative; see PFT 665), it seems that translating it as “one” (with positive) could be more convincing. Therefore, a writing of a term correlated to the same akkari is well justified. However, as photographs show, there is not enough space to write ak-ka4-ri in the damaged part of the text. Here, I suggest a reading of a term related to ki+personal ending -r (ki-ri or ki-ir), that also means “one” (see PFT 713). 2. A reading of ˹ḫu-be˺ [in-tuk-ki]-˹me˺ “for that reason” matches the photographs, and there is space for just three signs to fill the eroded gap between be and me. Therefore, the earlier [in-tuk-ki-um-me] is corrected here (see JA 281, 23). It is possible to interpret different variant writings of hupe intukkime (in-tuk-ki-um-me in §3 and in-tuk-ki-me here) as a reflection of different scribes. The variant in-tuk-ki-me also appears in other AE texts (see PFT 702). 3. A reading of ašši-˹ik˺-[ka4-ia?-ma?-ti?-iš] is suggested for the earlier ašši-ik-ki-u2-ma-ti-iš (see KT 1907: 103). In the quite eroded part of the text, the third and forth traces seem to better match ka4 and ia than ki and u2. The new suggestion demonstrates Šikkayamatiš and corresponds to OP Sikayuvatiš (see CII 1/1/1, 53)—linguistically an Old Iranian name for a fortress in Media. Considering Old Iranian names attested in AE texts, it is possible to analyze the new suggestion. Syllabically, the geographical name ašši-ik-ka4-ia-ma-ti-iš could be parallel to names such as aš.ašbe-zi2-ia-ma-ti-ia in PF 330, 3-4 and PF 2027, 3-4 or be-ši-ia-ma-ti-ia in PF 329, 4-5, that are AE correspondences of the Old Iranian OP Paišiyāuvāda (see PFT 678), a geographical name that was associated with the rise of Gaumāta. 1. A reading of [ka4-te-ma] “in its place” matches the photographs of this text section. Therefore, I suggest the new reading instead of the earlier aška4-te-ma (JA 281, 23). 3. ˹ašul-ḫi-meš˺ [x-x-x]-˹ma˺. Only several traces at the quite eroded part of the text are visible. As the photographs show, the term ašul-ḫi-meš “(royal) house” is recognizable, but followed by three ambiguous traces. Although Cameron assumed the third trace as ip (see JCS 14, 63), comparing with other instances of ip nearby, the traces do not seem to resemble ip. Moreover, the earlier restorations of ašul-ḫi-meš-˹mar da-nu!-ip˺ and ašul-ḫi-meš [mar-ri-be? ]-ip-+pa2 do not match the photographs (PFT 680 and Aliyari 2015: 109). Furthermore, a semantic relationship of restorations such as ašul-ḫi-meš-mar da-nu-ip-ma, or ašul-ḫi-meš mar-ri-ip-ma with OP vi𝜗bišcā “(together with) houses” and ˹e2˺ qa-ša2-tu2 “bow estates” are ambiguous (see CII 1/1/1, 53 and CII 1/2/1, 17, 55). Since Cameron assumed the first faint trace as mar (see JCS 14, 64), I suppose that the term after ašul-ḫi-meš is mar-ri-da (=marrida “all”; see PFT 726). Therefore, it is possible to translate ˹ašul-ḫi-meš˺ [mar?-ri?-da? ]-˹ma˺ as “(what) for all(?) (royal) houses” or “all(?) (royal) houses.” I cannot offer a better alternative. 4. ˹dištaš-šu-ip2˺ [ka4-at?-te-ma] ˹zik-ki˺-da. As far as photographs show, in the eroded part of the text dištaš-šu-ip2 and zik are discernable. But between them there is space to write four signs. Restoration of ka4-at-te-ma matches the visible faint traces and seems to be a variant writing of kate (kat+-e) followed by the postposition -ma (see PFT 712 & 722). Therefore, a new reading is suggested instead of the earlier aška4-te-ma (see JA 281, 24). 5. dišda-a-ia-u2-iš ˹ap-pa da˺-[a-e ku?-ud? ]-˹da ḫi zi2˺-la … . A restoration of ku-ud-da is suggested for the earlier mar-ri-da (see JA 281, 24). According to photographs, ap-pa and da are still recognizable at the beginning of the eroded part of the text. Obviously, da-a-e, “(which are) others,” follows them, corresponding to OP anyā (see CII 1/1/1, 53). A space for three signs follows, in which the thirth trace resembles da. It should be mentioned that a restoration of mar-ri-da (=marrida) “all, every” yields spaces between restored signs less than those between the intact signs. Furthermore, there is no implication of “all, every” or any other term in correspondence to mar-ri-da in OP and Bab. versions. But a restoration of ku-ud-da (=kudda) “and” yields similar spaces, as one can see in the line. In fact, in §13, Darius emphasizes the fact that he restored and put the Persians, the Medes and other nations in their appropriate places. 1. sa-ap diškam˺-ma-ad-da ˹ak-ka4 dišma-ku-iš dišu2˺ [ir?] ˹ḫal˺-pi-ia, “When I killed Gaumāta the Magus.” The passage is quite damaged from erosion from the beginning of the pertinent line until pi. As photographs show, there is a gap between u2 and ḫal and probably, a sign is written here. I suggest reading ir as a singular pronoun accusative which means “him” (see PFT 702). 2. dišnab-ku-tur-ru-˹sir˺ [diš]˹dumu nab-bu-ni-da-na˺, “Nebuchadnezzar, son of Nabonidus.” The passage is quite damaged at the beginning of the pertinent line and there is a gap between sir and the logogram dumu. An examination of this gap through the photographs substantiated a writing of a vertical wedge as a determinative for the logogram dumu, “son.” Previous scholars did not include this determinative in their editions. 1. ašba-pi-li, “Babylon.” The examination of the photographs shows that the sign preceding ba-pi-li is clearly the geographical determinative aš. In earlier editions, this sign is misread as the determinative diš (see JRAS 15, pl. ii; KT 1907: 108; and JA 281, 25). 2. Previous be-sa-ib-ti is corrected to be-sa-ib-ba? (see JRAS 15, pl. ii; KT 1907: 108). Detailed examination of the photographs shows that the last traces of this term on the rock resembles ba, not ti. The new reading demonstrates the term besappa that could be a conjugation II connective form of besa-. Whereas Hallock translated besapti as “they were deployed(? )” (see PFT 678), I prefer bessapa as “(they were) deployed(?) and.” In 1959, Hallock discussed the occurance of such connective forms (see JNES 18, 11-12). 3. ˹ku-ud-da aša-meš˺ [ḫu? ]-uḫ-be gešma2-meš-na. According to the photographs, all signs before uḫ have suffered from severe erosion. However, only one of them is completely lost. This sign, written following the plural marker meš, became quite illegible due to a crack. Following uḫ is a sign that was previouly assumed to be the determinative aš for gešma2-meš (see PFT 722). Cameron restored [ḫa]-aḫ as an Elamite reproduction of OP āḫa “it was” (see JCS 14, 64). However, I am not persuaded by such slavish reproduction of an OP term. Meanwhile, another restoration of [ḫu? ]-uḫ and its interpretation as “full” by Hinz & Koch yields this translation: “and the river (Tigris) was full of boats” (see EIW: 684). This interpretation disagrees with OP and Bab. correspondencess that imply the river was full of water. Detailed examination of the text shows that the sign before the determinative geš is indeed be, misread by earlier scholars as the determinative aš. On the other hand, a writing of gešma2-meš (not aš.gešma2-meš) is attested in AE texts (see PFT 722). Therefore, a new suggestion of [ḫu? ]-uḫ-be as a “there”-deixis non-personal pronoun (see Paper 1955: 105), follows aša-meš “water, river.” In this case, aša-meš ḫu?-uḫ-be means “that water” or “that river” and the discussed phrase is translated as “and that river (Tigris) was navigable” or it was passable only by boats. 4. dišu2 dištaš-šu-˹ip2 maš-ka4-um-ma˺ [ḫa]-˹zik-ka4˺, “I deposited the troops on leather-skins” or “I supplied the troops with leather-skins.” Previous zik-ka4-ka4 or ˹zik-ka4˺ should be corrected (see JCS 14, 64 and Aliyari 2015: 112). The examination of the text shows that a sign is definitely written between ma and zik, whose traces well resembles ḫa. The new reading of ḫa-zik-ka4 demonstrates ḫazikka “as/on (it) I deposited,” which is ḫa- + zikka. The second element is well attested as a conjugation I of zikka- (see PFT 774) and ḫa- is a generalized obliqe resumptive pronoun used as verbal prefix (PFT 685). Related forms such as ḫazikkak, ḫazikkaka, ḫazikkaš and ḫazikkašta appear in AE texts, all derivations of ḫa- + zikka- (PFT 696). 1. Unlike the appearance of dišda-ri-ia-ma-u-iš in other passages of the Elamite version of Behistun, the name of Darius is written ˹dišda-ri-ia-u-iš˺ in §19. Fortunately, all signs are treaceable and the scribe omitted the inclusion of ma. Among available copies or editions, Norris correctly included this name in his narrative (see JRAS 15, pl. ii) and also Weissbach implied the omission of ma in a footnote to his edition (see VAB 3, 26 & 27). Also, Vallat included ašda-ri-ia-<ma>-u-iš (see Vallat 1977: 95). It is probable that the scribe/engraver omitted ma in writing of this name; however, in a number of Persepolis texts, the writing of dišda-ri-ia-u-iš is attested (see PFT 680). 2015 The Elamite Version of Darius the Great’s Inscription at Bisotun. Tehran: Nashr-e Markaz Publishing Co.
2015 “A Re-examination of Two Terms in the Elamite Version of the Behistun Inscription.” Digital Archive of Brief Notes & Iran Review, Vol. 1/1, 2-7. 2008 “Evidence of the Persian Empire’s Multilingualism and Interpretation of DB #70.” Proceedings of the SCRIPTA 2008, Seoul, Oct. 8-12, pp. 135-159. 1960 “The Elamite Version of the Bisitun Inscription.” JCS 14, 59-68. 1970 “À propos de la notion de sub-ordination dans la syntaxe Élamite.” JA 258, 213-236. 1993 “La version élamite la trilingue de Behistun: une nouvelle lecture.” JA 281, 19-59. 1975 “Le semi-auxiliaire ma- en Élamite.” JA 263, 211-217. 1959 “The Finite Verb in Achaemenid Elamite.” JNES 18, 1-19. 1969 Persepolis Fortification Tablets (PFT). Oriental Institute Publications 92. Chicago: The University of Chicago Press. 1987 Elamisches Wörterbuch (EIW). Archäologische Mitteilungen aus Iran suppl. 17. Berlin: Reimer. 1950 Old Persian: Grammar, Texts, Lexikon. AOS 33. New Haven: American Oriental Society. 1907 The Sculptures and Inscription of Darius the Great on the Rock of Behistun in Persia, A new Collation of the Persian, Susian and Babylonian Texts. London : Longmans. 1855 “Memoir on the Scythic Version of the Behistun Inscription.” JRAS 15, 1-52 , 53-60, 61-213. 1955 The Phonology and Morphology of Royal Achaemenid Elamite. Ann Arbor: University of Michigan Press. 1978 The Bisitun Inscriptions of Darius the Great, Babylonian Version. Corpus Inscriptionum Iranicarum (CII), Part 1. Inscriptions of Ancient Iran, Vol. 2: The Babylonian Versions of the Achaemenian Inscriptions. London: SOAS. 1911 Die Keilinschriften der Achämeniden. VAB 3. Leipzig: J. C. Hinrichs’she Buchhandlung.